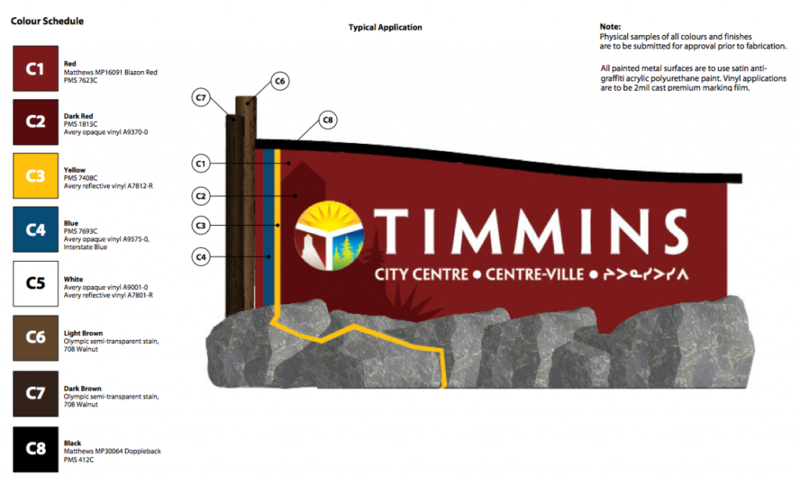 The Timmins Community Brand Committee has finalized the Request for Proposals (RFP) for the new gateway signage and it is now available. On June 16, Council approved the locations for the first two signs: the one at the east end of the city will be located on Highway 101 just west of the Frederickhouse River bridge. The one at the west end will be set up near the Kamiskotia Highway turnoff on Highway 101. Creating a welcoming entrance to the City was one of the key recommendations from residents who attended the planning sessions in 2011. Many believe that attractive, bold signage announcing our City will create a positive first impression for visitors, and generate community pride in residents. The City has elected to build two gateway signs this summer. There are plans to erect at least two more large gateway signs (one on Highway 655 and another near the Airport). The Timmins Chamber of Commerce‘ Business Takes the Lead fundraising project team has stepped up to raise the money needed for these. This is a great reflection of the community’s involvement in the Timmins 2020 Strategic Plan! The Team 2020 Steering Committee is grateful to all of the community partners, organizations, businesses and individuals who are making this plan a reality. The Committee hopes to receive several competitive proposals for the Gateway Signs, including submissions from local providers. Click here to download the Request for Proposals document, which is posted at the City of Timmins website. If you know of any local signage contractors, please share this link!